Citation: Keppel Hesselink JM. Phenytoin cream in painful diabetic neuropathy: an evolving chapter. J Diabetol. 2018;2(2):6-8. In this brief overview, the context described has led to the discovery, development and patenting of phenytoin cream as a new treatment for Painful Diabetic Neuropathy (PDN). This phenytoin repurposing project highlights the potential of wellknown drugs in innovative applications or formulations in this field and the value of patenting such ideas. The first clinical effects in peripheral painful neuropathies were seen in 2015, using various prototypes of creams and based on concentrations of 5% and 10% phenytoin or phenytoin sodium. Based on that data two patents have been designed, both of which are current in the Patent Cooperation Treaty (PCT) phase [1,2]. The essence of filing an international patent application under the PCT is that it helps applicants to simultaneously seek protection for an invention in a very large number of countries. When striving to develop a new therapeutic inroad in the field of painful neuropathies, the patent defines one fundament, but the size of the population to treat is also an important motivator for the registration and subsequent marketing of such therapy. The global PDN market was estimated in 2017 to have a value of US$ 4,811.8 billion and is projected to reach US$ 8,962 billion by 2026 . The Chemotherapy Induced Peripheral Neuropathy market value is in the same ballpark but about 5% less. To date the market size of other indications, such as small fiber neuropathic pain and chronic idiopathic axonal neuropathy, are still unclear since no analgesics have entered these segments, and no guidelines exist. Therefore, the medical needs in this segment, which is high due to the high numbers needed to treat most analgesics, remains significant and the development in this segment is encouraging due to its impressive volume. Regulatory bodies have been shown to be sympathetic to the repurposing of old molecules, and success in the Netherlands of such repurposing has recently been shown with 6-TG (a thiopurine metabolite) within the treatment of inflammatory bowel diseases. Meanwhile, we have developed a phase III program for phenytoin 10% in the treatment of PDN, and have consulted with the Dutch Medicines Evaluation Board. A simple phase III program has been reviewed and agreed upon and our project is now entering phase III. In our tertiary referral center, the Institute for Neuropathic Pain (INP), we have treated many patients suffering from localized peripheral neuropathic pain since 2009. We have developed, together with a compounding pharmacist, a base cream that has enabled us to compound creams containing amongst others amitriptyline, ketamine, clonidine, baclofen, and more recently, phenytoin. We have prescribed a great number of these topical formulations as both mono-drug formulations and combinations . After we tested many different Active Pharmaceutical Ingredients (APIs), we wanted to improve the efficacy and applicability of topical formulations containing such ingredients. Some of the APIs, such as amitriptyline, had to be dosed quite high (10%) to obtain efficacy, and this often lead to enhanced local irritation of the skin. Phenytoin was identified as a perfect API for development as a topical formulation, due to its high lipophilicity and its low molecular weight. These 2 aspects support the further development in a topical vehicle. We selected a cream because most patients suffering from peripheral neuropathic pain have thin, sensitive and dry skin, especially those suffering from diabetes. The emollients of the cream have been developed in the past to protect this skin type. Furthermore, phenytoin has been used successfully as a topical treatment for wounds, including diabetic ulcers . Most hands-on experience in the Netherlands is based on 10% phenytoin cream, but 15%, 20% and 30 % creams have also been tested . Given the pharmaceutical properties of the cream, the optimal dose is expected to be somewhere between 10% and 20%. Twenty percent and higher doses are possible, but the smear ability of the cream decreases hand in hand with rising concentrations. We selected one base cream specifically for its superior pharmaceutical and handling properties, and also because it has superior effects on the quality of the skin in elderly and diabetic patients. Patients report enthusiastically about its emollient nature. We have analyzed the efficacy and safety of various concentrations of phenytoin creams, and based on literature, our own online safety data pool and patients’ feedback, we found sufficient proof for relevant analgesia and positive effects on impaired sleep, while the tolerability was excellent [7,8]. In my practice I did not see any patient dropping out of therapy due to tolerability issues. Patients can use the cream regularly, or on an as needed basis, for instance before going to bed or during the night when awake due to pain. Furthermore, some patients reported back to us that they were able to reduce the dose of oral analgesics, for instance amitriptyline and pregabalin and this often helped to reduce adverse events. Meanwhile, a number of pain specialists in the Netherlands are prescribing this cream for a wide range of localized peripheral neuropathic pain syndromes, such as PDN, chronic idiopathic axonal polyneuropathy, chemotherapy-induced polyneuropathy and small fiber neuropathy, as well as in complex regional pain syndromes. We recently reported our experience in the peerreviewed and PubMed indexed journal ‘Pharmaceuticals’ . In this paper we also reported the first analysis of a single-blind response test in a cohort of 12 patients, indicating a quick onset of action, within 30 minutes and a clinical significant decrease in pain. Together with the international pain experts, we explored the mechanism of action of topically applied phenytoin [10,11]. Due to the fact that peripheral painful neuropathy mostly has a symmetrical expression and pain is comparable in both feet in quality and intensity, we developed the single-blind response test. This test helps us to find the best fit between the mechanism of action of the cream and the pathogenesis of the pain-syndrome. Using this test, the patient is its own control, and within a short timeframe, mostly 10-20 minutes, a clear difference is felt between the application of placebo cream on one foot and phenytoin cream on the other [7,8]. To date we feel that most painful neuropathies responding to the therapy are those where small fiber neuropathy plays a significant part in the pathogenesis, such as in PDN. The origin of these syndromes is located in the epidermis and the local nociceptors and their sodium channels are over-activated, leading to continuous and mal-adaptive firing patterns. Phenytoin inhibits this over-activity, thus leading to pain reduction via a peripheral mechanism of action, Figures 1 and 2 shows the local mechanism of action in painful diabetic neuropathy. 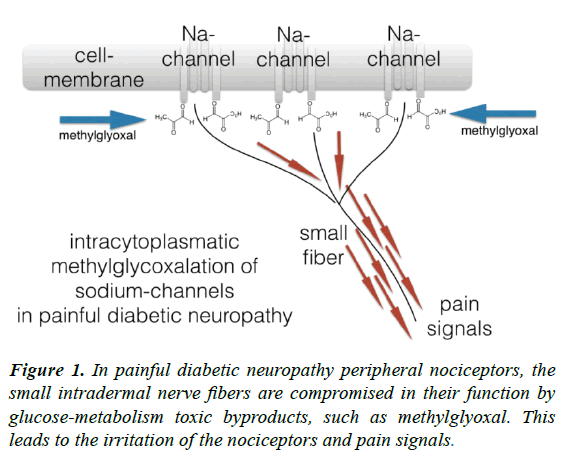 Figure 1: In painful diabetic neuropathy peripheral nociceptors, the small intradermal nerve fibers are compromised in their function by glucose-metabolism toxic byproducts, such as methylglyoxal. This leads to the irritation of the nociceptors and pain signals. Figure 2: Phenytoin is a broad acting sodium channel blocker. After applying phenytoin cream, pain signals in the small nerve fibers will be reduced. We could also use the response test to explore the dose-effect relationship of phenytoin cream: based on the single blind test paradigm we could demonstrate that raising the concentration led to enhancement of the clinical effect [6,12-14]. This is another argument supporting its pharmacological mechanism of action in the periphery. In all of our patients where we measured plasma concentrations of phenytoin, the level was below or around the limit of detection (1ug/ml). It seems that most peripheral neuropathies leading to symmetrical (burning) pain are responsive to phenytoin cream. We described clinical effects in PDN, small fiber neuropathic pain, and effects in Chemotherapy-Induced Peripheral Neuropathy (CIPN), next to positive effects on disturbed sleep patterns. Furthermore, we found a clear analgesic augmenting effects of phenytoin added to other topical analgesic creams [15-19]. In one of our first case series, we also reported clinical effects in Chronic Idiopathic Axonal Neuropathy (CIAP) . Phenytoin can be compounded in various concentrations in a suitable topical vehicle such as a cream and can serve to reduce neuropathic pain in peripheral neuropathies. Its tolerability is good and many patients report a quick onset of action, within 30 minutes. The dose range we explored to date is 5% to 30%, and most patients seem to respond favorably after the application of 10% cream. In some cases of a partial response, we found that a higher concentration led to a better response. In case of partial responders, a combination with oral analgesics always remains an option; in general patients seem to be able to reduce the dose of oral analgesics when treated with topical phenytoin cream. During a meeting with the Dutch Medicines Evaluation Board in June 2018, the agency supported the start of a crisp, short and clear phase III development in PDN. Currently we are discussing study designs with two academic centers, while looking for a partner to take over the further development and registration of the phenytoin cream. The author is a patent holder of two patents related to the topical formulations of phenytoin in the treatment of neuropathic pain. Patent: Topical phenytoin for the use in the treatment of peripheral neuropathic pain. 2018. Patent: Topical pharmaceutical composition containing phenytoin and a (co) analgesic for the treatment of chronic pain. 2018. Global painful diabetic neuropathy drugs market, 2018- 2026 - $8.96 billion market opportunities in approved targeted therapy drugs. 2018. Keppel Hesselink JM, Kopsky DJ. Topical Compounded analgesic treatment in neuropathic pain: 8 years of experience. J Pain Manage Med. 2017;3:128. Keppel Hesselink JM. Phenytoin repositioned in wound healing: Clinical experience spanning 60 years. Drug Discov Today. 2018;23:402-8. Kopsky DJ, Keppel Hesselink JM. A single-blind n-of-1 study evaluating 4 different doses of phenytoin in a topical analgesic cream for the treatment of peripheral neuropathic pain. J Pain Manage Ther. 2018;2:17-20. Keppel Hesselink JM, Kopsky DJ. Phenytoin cream reduces pain and improves sleep in patients suffering from neuropathic pain. Austin J Anesthesia and Analgesia. 2017;5:1061. Keppel Hesselink JM, Kopsky DJ. Topical phenytoin cream in small fiber neuropathic pain: Fast onset of perceptible pain relief. Int J Pain Relief. 2017;1:015-019. Kopsky DJ, Keppel Hesselink JM. Phenytoin cream for the treatment of neuropathic pain: Case series. Pharmaceuticals (Basel). 2018;11:E53. Keppel Hesselink JM, Kopsky DJ, AK Bhaskar. Skin matters. The role of keratinocytes in nociception: A rational argument for the development of topical analgesics. J Pain Res. 2017;10:1-8. Keppel Hesselink JM, Notermans NC. 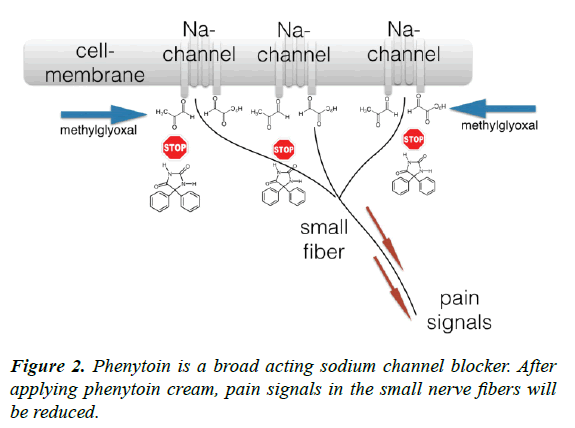 Topical phenytoin formulations for pain in small fiber neuropathy, a pathogenetic approach. Gen Int Med Clin Innov. 2018;3:2- 4. Keppel Hesselink JM. Single-blind placebo-controlled response on phenytoin 10% in painful diabetic neuropathy. Gen Med Open. 2018;2:2-3. Keppel Hesselink JM, Kopsky DJ. The value of placebos to individualize pain therapy via a new single-blind test paradigm identifying responders on topical analgesic interventions. J Pain Relief. 2018;7:313. Keppel Hesselink JM, Kopsky DJ. The individualized N-of- 1 trial: dose-response in a single-blind cross-over response test of phenytoin 10% and 30% cream in neuropathic pain. EC Anaesthesia. 2018; 4:1-6. Keppel Hesselink JM, Kopsky DJ. Topical phenytoin cream in small fiber neuropathic pain: fast onset of perceptible pain relief. Int J Pain Relief. 2017;1:15-19. Keppel Hesselink JM, Kopsky DJ. Burning pain in small fibre neuropathy treated with topical phenytoin: rationale and case presentations. J Clin Anesth Pain Med. 2017;1:6. Keppel Hesselink JM, Kopsky DJ. Pain in chemotherapy induced peripheral neuropathy treated with topical phenytoin cream. CP Cancer Sci. 2017;1:008. Kopsky DJ, Keppel Hesselink JM. Phenytoin in topical formulations augments pain reduction of other topically applied analgesics in the treatment of trigeminal neuralgia. J Clin Anesth. 2017;38:154-155. Kopsky DJ, Keppel Hesselink JM. Topical phenytoin for the treatment of neuropathic pain. J Pain Res. 2017;10:469-473.